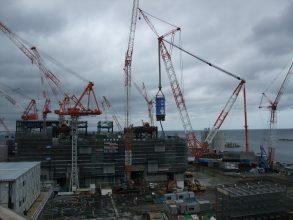 On August 10, the Chugoku Electric Power Co. filed an application with Japan’s Nuclear Regulation Authority (NRA) for examination of its Shimane-3 Nuclear Power Plant (NPP, 1,373MWe, ABWR) for compatibility with the country’s new regulatory standards. Construction work began on the unit more than a decade ago, in December 2005. In July 2009, the reactor pressure vessel was installed, with Mayor Masataka Matsuura of Matsue City looking on. Construction had continued to progress toward expected commissioning in December 2011. While 93.6 percent of the work had been completed as of April 30, 2011, construction was suspended, and plans revised, in the wake of the giant earthquake that occurred in March 11 of that year. In 2014, the Electric Power Development Co. (EPDC, or J-Power) filed an application for an examination for its Ohma NPP, which was then also under construction. Shimane-3 is thus the second such NPP in the same situation. In May 2018, prior to submitting the application to the NRA, Chugoku Electric, in accordance with its safety agreements with Shimane Prefecture and Matsue City, submitted requests for their consent to its plan. In June and July, explanatory meetings were held for residents in Shimane and Tottori Prefectures, asking for their understanding on safety measures for the Shimane-3 NPP. As for the other reactors constituting the Shimane Nuclear Power Station (NPS), Shimane-2 is proceeding through its compatibility examination by the NRA, while Shimane-1 was designated for decommissioning in 2015.